When the Cyrus family decided to create a housing community out of their ranch and farming land, in order to make it look good and be attractive to buyers they built a water feature and named it Aspen Lake, using their allotted irrigation water. Then, to enhance the beauty of the lake even more, they purchased two pairs of trumpeter swans and turned them loose. Three of the four swans are now deceased, but the surviving one, a female named Eloise, has become a mother. Thanks to the generosity of the Aspen Lakes homeowners, a partner for Eloise, Pete, was purchased from a swan-raising facility back east. The pair’s cygnet, (baby swan) named Sydney, has become part of the Oregon Department of Fish and Wildlife’s (ODFW) and The Trumpeter Swan Society’s (TTSS) trumpeter swan community at the Summer Lake Wildlife Management Area. 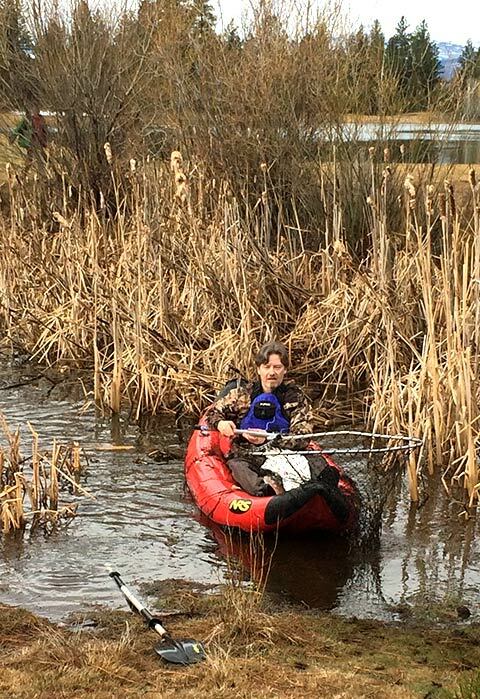 But the capture of Sydney didn’t happen without a lot of anxiety, hard work and that now-full-grown swan trying to sink ODFW wildlife biologist Simon Wray’s kayak. It took a team of six volunteers quite some time to get Simon close enough to Sydney — who weighs about 25 pounds and has enough power in her wings to knock a grown man to his knees — to get her into a net, and then a great deal of creative boating to get said swan and net to shore. Others placed the unhappy bird in a carrying cage and safely transported her to Summer Lake. Now Sydney will become a vital member of ODFW’s trumpeter population, and hopefully be productive in the growing family of swans at Summer Lake. The cooperative efforts of the Aspen Lakes community keep Eloise and Pete safe, and fed with a daily food supplement. The kindness and generosity of the homeowners supplied the birds with an automatic feeder and a bubbler to keep the pond from freezing.